Join the Bungendore and District Sheepdog Association at the Bungendore Trans Tasman Sheepdog Trial, to be held at the Bungendore Showgrounds from 15-18 June. 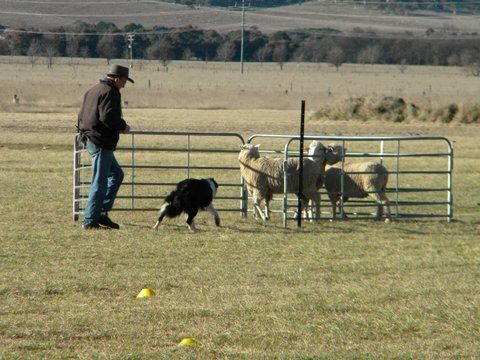 The trial combines elements of the Australian and New Zealand Sheepdog Trials rules. Competitors at this event may be in the running to represent Australia in the Trans Tasman Trial where dogs and workers compete in a team of four in one of the most closely contested Australia v New Zealand sporting event. The Trans Tasman Trial is a true test of man, dog and sheep. The competition is conducted over a special course with its own rules, developed specifically for the Trans Tasman competition. It is a mix of both Australian and New Zealand rules. The Trans Tasman course consists of 4 obstacles – a gate, a Maltese cross, a ramp and a pen. Australian rules apply as far as the gate, followed by a NZ drive through the Maltese cross and over the ramp, then back into an Australian carry to the pen. In the New Zealand sections competitors are allowed to assist their dog more than in the Australian section, thus showing their stockmanship skills. The course must be completed in 15 minutes.